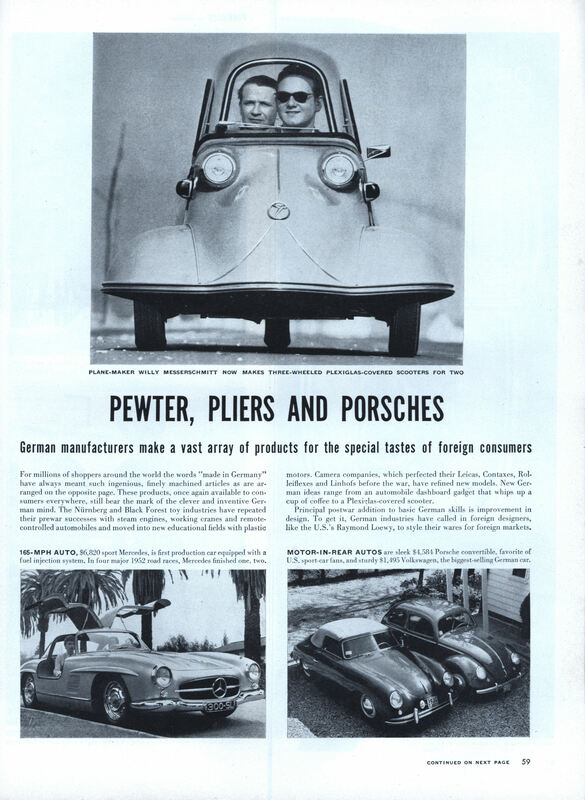 For millions of shoppers around the world the words “made in Germany” have always meant such ingenious, finely machined articles as are arranged on the opposite page. These products, once again available to consumers everywhere, still bear the mark of the clever and inventive German mind. The Niirnberg and Black Forest toy industries have repeated their prewar successes with steam engines, working cranes and remote-controlled automobiles and moved into new educational fields with plastic motors. Camera companies, which perfected their Leicas, Contaxes, Rolleiflexes and Linhofs before the war, have refined new models. New German ideas range from an automobile dashboard gadget that whips up a cup of coffee to a Plexiglas-covered scooter. 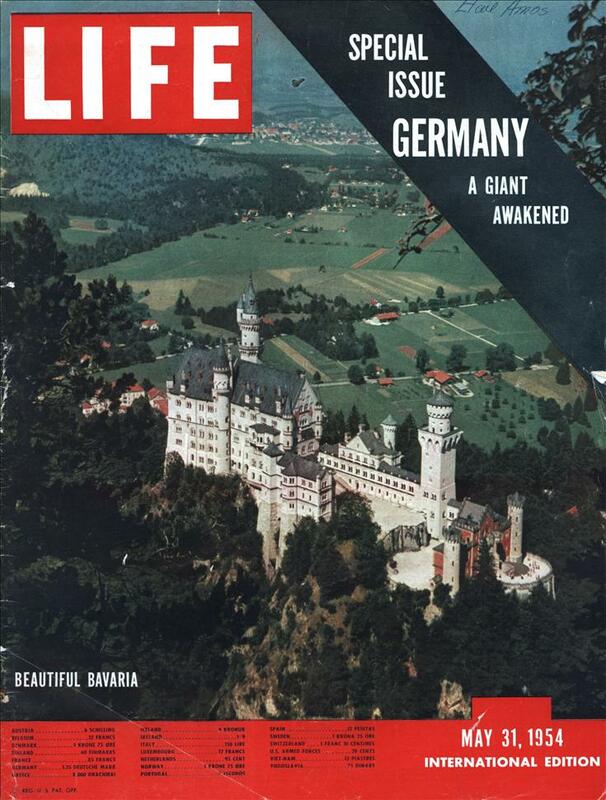 Principal postwar addition to basic German skills is improvement in design. To get it, German industries have called in foreign designers, like the U.S.’s Raymond Loewy, to style their wares for foreign markets. Today there are more artists—half again as many more— at work in Western Germany than there were 20 years ago when Hitler came to power. The numerous museums and galleries are crowded with people who come to look and to buy. A single exhibition of contemporary German art in Munich last summer drew 60,000 visitors who, with their limited earnings, bought 180 works. Such craving is understandable in a people who for years were not allowed to see or produce creative and vital art. When Hitler abolished the “degenerate” work of world-famous men like Paul Klee, Karl Hofer (above) and other moderns in favor of “healthy, Aryan” products, the major artists were forced to flee the country, work in secrecy or cease working altogether. In 1945 they emerged with pent-up energy and tremendous will to create again. Seeing anew or for the first time the innovations of modern French art, the majority plunged headlong into abstractionism. Today they are working out their personal styles, each in his way trying to make up for the frustration and isolation that stifled them for more than a decade. WINDOW DESIGNER Near Cologne, Painter Georg Meistermann, 43, earns a living designing stained-glass windows for churches and for secular buildings. In the Cologne radio station (left) he decorated the stair-well windows with abstractions to suggest electronic equipment. MUNICH MODERN Once a student of Klee, Munich’s Fritz Winter, 49, spent three years in a Russian prison camp. Since his release in 1949 his dynamic abstractions, exhibited internationally, have established him as the outstanding new painter of postwar Germany. NEW BERLIN GROUP Foremost center of German art is Berlin, where exponents of every style have congregated. Most of the city’s leading artists have joined together in an informal association known as the New Berlin Group and have held joint shows every year since 1949. The majority teach at the Western Academy of Fine Arts which is flooded with students from both west .and east sectors of the city. Members of the group, shown with their work, include (above, from left): Hans Kuhn, 48, ex-war prisoner whose art stems from “dreamlife”; Juro Kubicek, 48, also ex-prisoner who developed abstract style in a U.S. PW camp; Hans Uhlmann, 54, sculptor who turns scrap metal into abstractions; (seated) Hans Thiemann, 44, former student of Klee; Max Kaus, 63, early Expressionist; Alexander Camaro, 53, onetime dancer; (leaning on painting) Hans Jaenisch, 47, a best-selling painter; Woty Werner, 51, tapestry designer, and her painter husband Theodor, 67; Bernhard Heiliger, 48, sculptor; Fritz Kuhr, 55, house painter during Nazi regime; (seated at table) Renee Sintenis, 66, who specializes in tiny bronzes. STUTTGART PRINT MAKER A hobby of making prints has turned into a profitable venture for Painter Willi Baumeister, 65 (above, center). With the aid of assistants in Stuttgart, he turns out editions of his own colorful, nonobjective work, as well as prints by other Germans which sell well both at home and in the U.S. Labeled “degenerate” by the Nazis, Baumeister painted in hiding during the war. He is now a teacher at Stuttgart Academy and one of the major influences on young German painters. ACADEMY PROFESSOR With Karl Hofer, Karl Schmidt-Rottluflf is one of the Berlin Academy’s most distinguished professors. A pioneer of the Expressionist school which centered in Germany, Schmidt-Rottluff was one of the first to be blacklisted by Hitler. Some 600 of his boldly colored paintings were confiscated and he was visited periodically by the Gestapo to see whether his brushes had been used. Today, at the age of 70, he still teaches a class and also paints in his studio every day. Faced with a prodigious rebuilding job, German architects at war’s end looked forward—as the artists did (preceding pages)—to working in the modern styles which Hitler had forbidden. They were handicapped, however, not only by an acute scarcity of materials but by the apathy of civic officials and laymen who resisted modern architectural designs and in many cases advocated a return to the safe styles of the 19th Century. This aversion to the modern was a paradox in the country which had been the center of advanced architectural ideas. Between 1919 and 1933 some of the world’s leading architects—Walter Gropius, Mies van der Rohe, Marcel Breuer—were at work at Germany’s famous Bauhaus (literally “building house”), a school where revolutionary concepts of architectural and industrial design were put forward. Most of the Bauhaus leaders left Germany for the U.S. when Hitler came to power. But many of their disciples remained and now have come to the fore. Working with concrete, glass and steel which today are available, they are building modern theaters, factories, stations, stores and homes. New apartments, like the looming rectangles above, are a further answer to the tremendous housing shortage, aftermath of the wartime destruction of five million homes, which still plagues the country. Along with the painters and sculptors, the architects are devoting special attention to rebuilding the war-torn churches whose former traditional contours are being recast in the inventive geometric styles which reflect Germany’s modern spirit. NEW CHURCH in Pforzheim was built over the ruins of bombed St. Matthew’s Church. The walls are of concrete blocks inset with octagons of colored glass. CONVERTED CHURCH in Frankfurt has its original outer walls but a new interior. Now used as a meeting hall, it is lighted by chains of neon lights. HOUSING PROJECT, covering six blocks in Hamburg, occupies the site of two-story houses which were all destroyed during the war. The administration building right has indented ground floor surrounded by pillars. The building with a canopy roof (background, left) has top-floor terrace studios for painters. ART SHOP in Bremen is a converted underground air-raid shelter fancied up with a modernistic entrance. Concrete roof has tiny glass panes to provide light. LUMINOUS BANK in Diisseldorf has mirrorlike marble columns which catch the reflections of fluorescent lights arranged in the shape of spoked wheels. A TRANSPARENT STAIRWAY, encased in glass, rises outside a Diisseldorf office building. Designed by H. Hentrich (above), it is a bright column at night.